Features Fixed Width, Web 2.0, Custom Menu, Top Navigation Bar, Slideshow, White, Black, 1 Left Sidebar, Auto Readmore, Bookmark Ready, Ads Ready, Widget Ready. Descriptions iPhone Games Blogger Template is a free iPhone related blogger template it has many features such as Fixed Width, Web 2.0, Custom Menu, Top Navigation Bar, Slideshow, White, Black, 1 Left Sidebar, Auto Readmore, Bookmark Ready, Ads Ready, Widget Ready. 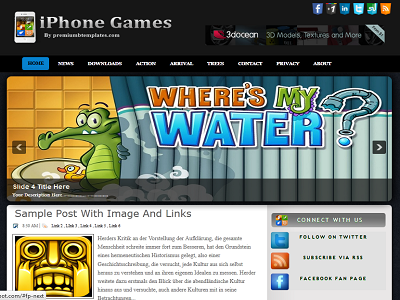 Its suitable for all kinds of blogs especially the games blog.